Draft: 2006, Colorado Rockies, 9th rd. Will and his wife, Caroline, reside in Baton Rouge, La., with their daughter, Lily, and son, Jack...Graduated from Slidell High School (La.) in 2002 where he pitched and played first base...earned All-State, All-Parish and All-District recognition... owned an 8-1 record with an 0.98 ERA during his junior season...Went on to play at Louisiana State University (LSU)...was a starter at first base from 2004-05, and started 56 games at third base in his senior season (2006)...appeared in 13 games that year as a relief pitcher, posting a 1-2 record with a 3.79 ERA, seven walks and 20 strikeouts...As a freshman at LSU, Will and his brother Clay became the first tandem of brothers to start in the same game for LSU (March 2, 2003, at Long Beach State) since Albert and Terry Belle did so in 1987... Will started at first base and Clay at third in a 7-2 LSU win...Was named to the 2004 NCAA Regional AllTournament Team after leading the Tigers with a .429 average in seven tournament games... helped push LSU to a berth in the College World Series...Drafted by Colorado in the ninth round of the 2006 MLB Draft...signed by Rockies scout Damon Iannelli...Was claimed off waivers by Houston from Arizona on Nov. 3, 2014...agreed to terms on a one-year contract on Jan. 11, 2019. 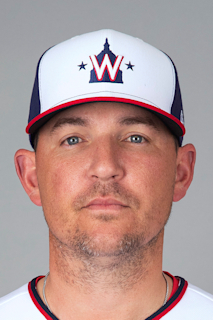 Made 61 relief appearances, tied for the second most relief on the club...posted a 2.48 FIP, the 10th-best mark among AL relievers...put up a career-high 53.1% groundball rate...also posted a career-high 31.9% swing and miss rate...his 27.8% strikeout rate was his second-best during his four seasons with Houston, behind his 29.4% mark set in 2017...recorded 16 holds...held right-handed hitters to a .187 batting average (20x107)...made his fifth-career Opening Day roster...recorded at least one strikeout in 17 consecutive games from May 12- June 26...marked the longest streak of his career (previously 12 games from 2017-18)...recorded multiple strikeouts in five consecutive games from June 8-18, the longest streak of his career...struck out a total of 25 batters in 15.1 innings during the streak...did not allow a run in his last 13 appearances of the season, spanning 13.1 innings pitched...opponents were just 5x45 (.111) vs. him in that span...ended the season on a career-long tying four-game winning streak...was on the Astros ALDS roster but did not make the ALCS roster...pitched in Game 3 of the ALDS at CLE, his only appearance of the postseason...pitched 1.0 inning, allowing one run on one hit. Had another strong season with the Astros, posting a 3-2 record with two saves, a 2.98 ERA (15ER/45.1IP) and 52 strikeouts in 46 games...marked a season-low for outings as an Astro, as he served two stints on the Disabled List...was his third consecutive season with an ERA under 3.00, making him one of three AL pitchers to maintain an ERA under 3.00 in every year since 2015 (min. 45IP), along with LHP Andrew Miller and RHP Cody Allen...walked seven batters in 45.1 innings for a 1.39 walks per 9.0 innings ratio, which ranked fourth in the AL...also ranked third in the AL strikeout to walk ratio (7.43, 52SO/7BB)...ranked 14th in the AL in WHIP (0.97)...posted a career-high 29.4% strikeout rate, and a career-low 4.0% walk rate...gave up just four runs in 24.0 innings on the road for a 1.50 ERA...finished the regular season by going scoreless in each of his last 15 road games (14.1IP)...made his fourth career Opening Day roster, and third with Houston...placed on the 10- day DL with right shoulder inflammation on July 11...was activated on July 28...did not pitch in a game and was placed back on the DL on July 30 (retro to July 28)...removed from the DL on Aug. 27 and had a healthy rest of the season...began the season with a seven-game scoreless streak from April 4-21...gave up two runs in April across 10 outings for a 1.74 ERA (2ER/10.1IP)...moved his career numbers in April with the Astros to 0.84 ERA (3ER/32IP) and 31 strikeouts...pitched a season-long 2.0 innings on May 7 at LAA...gave up three runs on May 14 at NYY in Game 1 of Houston's doubleheader...snapped a 35-game streak where he did not give up multiple runs (dated back to Aug. 9, 2016)...recorded a strikekout in 11 straight games from May 25-June 24 (19SO/11.1IP)...was scoreless in eight of his final 10 regular seaosn appearances, yielding just two earned runs and seven hits across 9.0 innings...made three rehab appearances in the minors this season across two separate stints...pitched a scoreless inning on July 26 with the Class A Advanced Buies Creek Astros prior to his abbreviated return from the DL on July 28...made two more rehab appearances after his second stint on the DL, one each with Double A Corpus Christi (Aug. 22) and Triple A Fresno (Aug. 25)...pitched in six postseason games across all three rounds of the playoffs, posting a 2.25 ERA (1ER/4.0IP) and three strikeouts...threw 0.2 of a scoreless inning in Game 1 of the ALDS vs. BOS...pitched in Games 3 (1ER/0.1IP) and 5 (0ER/1IP) of the ALCS at NYY...was scoreless in all three of his World Series outings...had a crucial 7th-inning outing in Houston's Game 2 win at LAD...stranded a runner at third base to keep Houston within one run of the Dodgers, striking out two in 1.0 inning pitched. Named to his first career All-Star Team in what was his sixth Major League season and second with Houston...finished 11th among AL relievers in ERA...became the first Astros reliever to post an ERA below 2.30 in consecutive years since RHP LaTroy Hawkins (2008-09)...was tied for the AL lead in holds (28) with RHP Dellin Betances and RHP Nate Jones...his 28 holds ranked tied for third in club history for a single season with RHP Pat Neshek (2015) and RHP Brad Lidge (2003), behind two separate seasons by RHP Octavio Dotel (33 in 2003; 31 in 2002)...became one of two pitchers in Major League history to have a season with at least 12 saves and 28 holds (also RHP Dellin Betances in 2016)...set career-best marks in strikeouts (69), saves, strikeout to walk ratio (4.60), groundball percentage (58%) and walks per 9.0 innings ratio (2.11), while falling two appearances shy of his career high of 68 set in 2015...posted two franchise record streaks...was scoreless in a club-record, 26 consecutive appearances from April 9-June 8...also had a franchise-record, 37-game streak without allowing an extra-base hit from April 7-July 5...allowed a run in his first outing of the season (April 7 at NYY), before rattling off his club-record, 26-game scoreless appearance streak that spanned 26.1 innings...the previous club record was a 25-game streak set by LHP Billy Wagner from 1999 2000...posted the third-longest single season scoreless inning streak by a reliever in club history (26.1 innings from April 9-June 8)...was the longest since RHP Dave Smith's club-record streak of 27.2 innings set in 1987...was also the second-longest scoreless inning streak by a Major Leaguer in 2016, behind RHP Michael Fulmer's 33.1-inning streak...did not allow an extra-base hit in each of his first 37 appearances of the season...the previous club-record streak of games without allowing an extra-base hit was held by RHP Dave Smith (34 games from 1986-87)...the last Major Leaguer with a streak this long was LHP Charlie Furbush (37 games from 2014-15)...was the longest streak to begin a season since RHP Wade Davis' MLB-record, 43-game streak to begin the 2014 season...allowed four runs on July 8 vs. OAK...had gone 42 consecutive games (dating back to Sept. 26, 2015) without allowing multiple runs in an outing, which was the fifth-longest streak in club history, and the longest since LHP Trever Miller's 50-game run from 2006-07...converted each of his first nine save opportunities of the season until suffering a blown save on July 19 at OAK...was the longest consecutive saves streak by an Astros pitcher since RHP Luke Gregerson's 16-game run from 2015-16...was named an AL All-Star for the first time in his career, and tossed a scoreless 0.1 of an inning in the All-Star Game at Petco Park on July 12...struck out Aledmys Diaz looking with two outs and the bases loaded in the 8th inning to help preserve a 4-2 lead for the AL...was scoreless in 16 of his final 18 outings of the season, posting a 1.04 ERA (2ER/17.1IP), 20 strikeouts and a .183 opponent average (11x60) in that span. Had one of the best seasons by an Astros reliever in club history, leading the team in appearances (68) and relief innings (71.0) while ranking fourth among AL relievers in ERA (1.90) and opponent batting average (.168)...marked the lowest ERA by a Houston reliever since RHP Brad Lidge posted a 1.90 mark in 2004...his opponent batting average was the lowest produced by a right-handed reliever in a single season in club history, and the fourth-lowest overall behind LHP Tony Sipp (.157 in 2014) and LHP Billy Wagner (.135 in 1999 and .165 in 1996)...posted career lows in ERA, opponent average and WHIP (0.90)...his groundball rate of 52.2% was a career high (previously 48.6% in 2013)...led the Majors with a .129 (15x116) opponent batting average against lefties, which also set a new club record for a single season (previously RHP Bill Dawley, .148 in 1983)...set an Astros franchise record by posting a .116 opponent batting average (16x138) during the ﬁrst half of the season (min. 150 batters faced)...the record was previously held by LHP Billy Wagner, who posted a .126 (18x143) opponent average during the ﬁrst half of the 1999 season...was tied for ninth among AL relievers in wins (5)...made his second appearance on an Opening Day roster...began the season with a 10-game scoreless streak, which marked the longest start of season streak byan Astro since 2008, when LHP Tim Byrdak and RHP LaTroy Hawkins started their seasons with 17-game runs...his scoreless streak to start 2015 coincided with his season-ending, 16-game scoreless streak with Arizona in 2014...amounted to a career-long, 26-game, 28.2-inning scoreless streak from Aug. 19, 2014-May 2, 2015...was the longest active scoreless innings streak in the Majors at the time, directly ahead of LHP Aroldis Chapman (26.1IP)...the 16-game scoreless streak to end 2014 marked a new Arizona club record...struck out three batters in three consecutive appearances from April 28-May 6...marked the longest such streak by an Astros reliever since RHP Philip Humber did so in 2013...tallied his ﬁrst career Major League save on Aug. 6 vs. OAK...struck out a career-high ﬁve batters on Aug. 16 vs. DET...pitched 2.0 innings in the outing, which also marked a career high...made his postseason debut with Houston, pitching in four total games...tossed a hitless 8th inning in the AL Wild Card Game at NYY...made three appearances in the ALDS against the Royals, allowing ﬁve runs (four earned) in 2.0 innings. In 29 relief appearances over three stints with Arizona, was 0-3 with three holds and a 4.34 ERA (14 ER/29.0 IP)...averaged 10.86 strikeouts per 9.0 IP (35 strikeouts), up from 9.06 in 2013...began the season with Arizona, appearing in seven games before being sent down to Triple A Reno...tossed 2.0 scoreless innings on Opening Day vs. LAD in Sydney, Australia...compiled a career-high 16-game scoreless streak from Aug. 19 through the end of season (15.2 IP)…the 15.2 scoreless innings were tied for the fifth longest streak to end the season…the 16-game scoreless streak to end a season marked a new Arizona club record...was 3-2 with a save and a 0.99 ERA (5ER/45.2IP) in 43 games with Reno…led all minor league relievers (min. 40 games) in ERA at the time of his final promotion on Aug. 18. Was 4-1 with a 2.91 ERA (17 ER in 52.2 IP) in 61 games in his first season with Arizona. Went to Spring Training with Colorado and was designated for assignment on March 29…claimed off waivers by Oakland on April 3 and by D-backs on April 6. Tied for seventh among NL rookies in appearances (also Brewers' Jim Henderson)…61 games also tied for fifth most by a D-back rookie in club history (also Doug Slaten in 2007). Recorded a 0.93 ERA (3 ER in 29.0 IP) on the road, the lowest among all NL relievers (min. 30 G) and thirdlowest in baseball…only Koji Uehara (0.74) and Tanner Scheppers (0.76) were better. Career-high 11 straight scoreless outings from June 9-July 4 (9.1 IP). Was 0-0 with a 4.63 ERA and 2 saves (6 ER in 11.2 IP) in 12 games with Triple-A Reno. Began the season at Triple-A Colorado Springs and was selected to the Major League roster on 8/11...Harris went onto make his Major League debut on 8/13 vs. MIL...in that outing he allowed three runs on two hits, one home run andone strikeout in 1.0 inning. Following his MLB debut, Harris tossed six scoreless outings, allowing three hits, no walks and seven strikeouts over6.2 innings from 8/15-25. Earned his first Major League win 8/15 vs. MIL with 2.0 perfect innings. Had multiple strikeouts in six of his outings...finished the season with a 9.7 strikeout per 9.0 inning rate. Made 13 appearances for Triple-A Colorado Springs in his first stint in Triple-A...picked up the win in his Triple-A debutat Tacoma on 7/13 after working a perfect 10th inning of the Sox 4-3 extra inning victory. Had the lowest ERA for any Sox pitcher with 10 appearances (1.02) in his 17.2 innings of work...also had the lowestopponent batting average (.145) and WHIP (0.57)...only allowed two runs in his 17.2 ip with Sox...did not allow a runin first five appearances for the Sox (7.0 ip). In his first action since the beginning of the 2009 season, saw action in 33 games out of the High-A Modesto bullpen ... was used primarily in late relief, allowing just two runs in 10.1 ip in the eighth inning. Spent the entire season on the disabled list. Made just one appearance with Short Season Tri-City on the season, pitching just 1.0 inning. Spent the full season with High-A Modesto and led the club in relief ERA among Nuts relievers with at least 50.0 ip ... by posting a 2.77 ERA (61.2 ip, 19 er) he has now owned a sub-3.00 ERA in all three professional seasons...opponents batted .221 (51-for-231) against him with lefties at .212 (22-for-104) and righties .228 (29-for-127) ... posted a 2.28 ERA (38.1 ip, 12 er) prior to the All-Star break and a 2.70 ERA (23.1 ip, 7 er) after the break. Pitched the entire year for Low-A Asheville making 38 relief appearances ... had the lowest ERA (1.32) of any Asheville pitcher ... led all Asheville relievers in strikeouts (68), as he had more strikeouts than innings pitched (47.2) ... his 38 appearances were the fourth-most on the team ... allowed earned runs in 6 of his 38 appearances ... did not allow an earned runfrom 6/28-7/24, a span of 11 appearances (12.1 ip) ... struck out a season-high 6 batters in 2.0 innings of work on 7/3. Spent first professional season with Tri-City ... was unscored upon in 19 of 22 games ... earned first professional save on 7/12. August 27, 2017 Houston Astros activated RHP Will Harris from the 10-day disabled list. August 24, 2017 Houston Astros sent RHP Will Harris on a rehab assignment to Fresno Grizzlies. August 22, 2017 Houston Astros sent RHP Will Harris on a rehab assignment to Corpus Christi Hooks. July 28, 2017 Houston Astros activated RHP Will Harris from the 10-day disabled list. July 26, 2017 Houston Astros sent RHP Will Harris on a rehab assignment to Buies Creek Astros. July 15, 2017 Houston Astros placed RHP Will Harris on the 10-day disabled list retroactive to July 11, 2017. Left shoulder inflammation. November 3, 2014 Houston Astros claimed RHP Will Harris off waivers from Arizona Diamondbacks. August 18, 2014 Arizona Diamondbacks recalled RHP Will Harris from Reno Aces. August 8, 2014 Reno Aces activated RHP Will Harris. August 4, 2014 RHP Will Harris roster status changed by Reno Aces. June 17, 2014 Arizona Diamondbacks optioned RHP Will Harris to Reno Aces. June 9, 2014 Arizona Diamondbacks recalled Will Harris from Reno Aces. April 14, 2014 Arizona Diamondbacks optioned RHP Will Harris to Reno Aces. May 8, 2013 Arizona Diamondbacks recalled Will Harris from Reno Aces. April 6, 2013 Arizona Diamondbacks claimed RHP Will Harris off waivers from Oakland Athletics. April 6, 2013 Arizona Diamondbacks optioned Will Harris to Reno Aces. April 3, 2013 Oakland Athletics claimed Will Harris off waivers from Colorado Rockies. April 3, 2013 Oakland Athletics optioned RHP Will Harris to Sacramento River Cats. April 1, 2013 RHP Will Harris assigned to Tulsa Drillers. March 29, 2013 Colorado Rockies designated Will Harris for assignment. March 15, 2013 Colorado Rockies optioned Will Harris to Colorado Springs Sky Sox. August 11, 2012 Colorado Rockies selected the contract of Will Harris from Colorado Springs Sky Sox. July 12, 2012 Will Harris assigned to Colorado Springs Sky Sox from Tulsa Drillers. March 30, 2012 Will Harris assigned to Tulsa Drillers from Modesto Nuts. May 5, 2011 Will Harris assigned to Modesto Nuts from Tri-City Dust Devils. April 4, 2011 Will Harris assigned to Tri-City Dust Devils from Tulsa Drillers. September 24, 2009 Will Harris roster status changed by Tulsa Drillers. June 20, 2009 Tulsa Drillers sent RHP Will Harris on a rehab assignment to Tri-City Dust Devils. April 16, 2009 Tulsa Drillers placed RHP Will Harris on the 7-day disabled list.